What is the bag/purse policy at Arena events? The main ticket office is located on the south side of the building with its entrance on R Street. The hours for the main ticket office are Monday – Friday / 11:30 a.m. to 5:30 p.m. The ticket office will be open Saturdays and Sundays to service events and for the first day of ticket sales, if that is a Saturday. 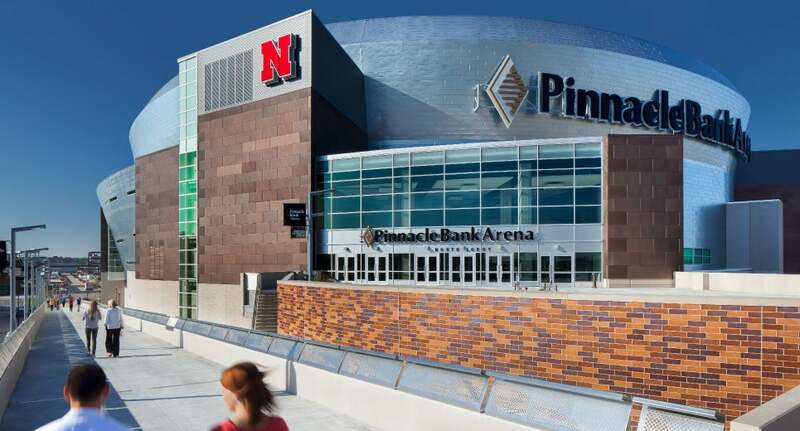 Outside of men’s and women’s Husker basketball games, Pinnacle Bank Arena hosts concerts, family shows, high school and college events and other events. A guest services station is located on the main concourse behind section 112. Containing 470,400 square feet, the Pinnacle Bank Arena seats 15,391 fans when configured for Husker Basketball games. It is divided into two bowls (upper and lower) and three levels (100, 200, 300) with Premium Seating Suites and Loge Boxes located between Level 100 and Level 200. There are 73 concession points of sale and a private Club Lounge, located on the Main Concourse (Level 100). There is seating for the disabled just off the main and upper concourses. There are 115 total wheelchair positions and 115 wheelchair companion seats in the new arena. I do not have Husker season tickets, but I want to get them. What do I need to do? Click http://bit.ly/HuskerBballtix and fill out the short wait list form for either men’s or women’s basketball season tickets and information will be sent to you. If you have any questions, please contact Matt Henry, Assistant Ticketing & Engagement Manager, [email protected], 402-472-3111. Nebraska will be the first school in the Big Ten Conference to feature an HD (6 mm) center hung video board for its basketball games. There are ribbon boards, stat boards, a state-of-the-art sound system and many fan amenities to enjoy. Are credit cards and debit cards accepted at concession stands? Credit cards and debit cards are accepted at all concession stands. ATMS are located in the arena as well.